Samford University honored 132 employees representing 1,560 years of service during the annual employee recognition luncheon Jan. 22. 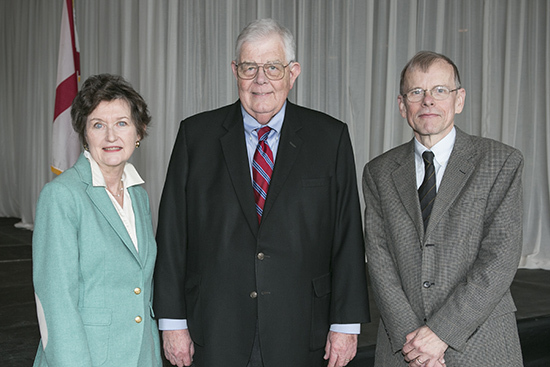 William A. Nunnelley, senior editor and director of public relations, was honored for 50 years of service. Nunnelley, who earned two degrees from Samford, has served in several capacities during his Samford career, including as sports information director and as the founding and current editor of Seasons, the university’s news magazine. Donald Sanders, professor of music, and Mary Wimberley, senior news and feature writer, were recognized for 40 years. Jeff Flaniken, assistant professor of music, introduced Sanders on behalf of School of the Arts Dean Joseph Hopkins, who is studying in Indonesia. “Mary is an excellent writer of extraordinary stories, as she has demonstrated time and again in finding and telling those Samford stories that get to the heart of who we are as an institution,” he added. Dollie Brice, kinesiology, was honored for 35 years as a faculty member. Thirty-year employees who were recognized included Jim Angel, kinesiology; Mark Fuller, facilities management; Ron Hunsinger, biology; and Glenda Martin, arts and sciences. Honored for 25 years of service were Linda Conner, continued learning; Lisa Dodd, printing; Catherine Evans, library; Tracy Luke, law; Connie Macon, Academy of the Arts; Kenneth Mathews and Frank Thielman, divinity; Morgan Ponder, chemistry; Dennis Self, technology services; and Pamela Sims, pharmacy. Twenty-year honorees included Jim Barnette, religion; Sandra Brinson, divinity; Amy Broeseker, Valerie Prince, Robert Riggs and Paula Thompson; pharmacy; Lamar Burton, technology services; Janet Carr, financial services; Jill Evans, law library; Joan Jackson, continued learning; Sharon Lawhon, music; and Michael Morris, athletics. Receiving 15-year awards were David Bains, religion; Janica Carter, marketing and communication; Abby Casey and Eric Knight, technology services; Jennifer Coleman, nursing; Betsy Dobbins, biology; Jann Hammel, law library; Bryan Johnson, University Fellows; Nena Sanders, health sciences; Lynette Sandley, core curriculum; Elizabeth McCullough, pharmacy; and Jennifer Taylor, library. Among the 31 employees honored for 10 years of service were Becky Ard, facilities; Mark Bateman and Mandy Hilsmier, education; Bill Belski, Chad Carson and Jeremy Thornton, business; Nancy Biggio, academic affairs; Charlotte Brammer, communication studies; Tony David, Casey Dunn, Michelle Durban, Zac Schrieber and Jay Yelton, athletics; Janet England, student affairs; Angela Ferguson, international programs; Libby Hamby, bookstore; Michael Hogue and Angela Thomason, pharmacy; Paul House, divinity; Cindy Kennington, biology; Melodie King, Academy of the Arts; Nick Madsen, campus recreation; Tanya Martin, residence life; Andy Montgomery, classics; Elaine Moody, spiritual life; Andy Parrish, marketing and communication; Chris Roper and Jeff Whitcomb, technology services; Debbie Strickland, library; Connie Walker, law library; and Jason Wallace, history. Wayne Lawley, Mark Mathieu, Mike McCluskey, Jeff Moreman, Alberto Pinon and Danny Williams, facilities management; Jack Berry, psychology; Jessica Bosley, education; Sherri Brown, Vicki Gaston and Val Merrill, divinity; Erin Carroll, Connie Cox, David Hutchens and Rusty Johnson, law; Susan Cooper, university services; Cyndi Cortes and Amy Snow, nursing; Mike Darwin, Matt DeFore, Leslie Jones, Casey Jo Kersey, and Debbie Partridge, business and financial affairs; Doug Davis and Debbie Duke, health sciences; Lee Farquhar and Sheree Martin, journalism and mass communication; Mike Gillispie, post office; Sara Helms and Darin White, business; Keisha Howard, Marvin Julich, Sam Shade and Lori Strand, athletics; P. J. Hughes, Maryam Iranikhah, Cheryl Miller and Whitney White, pharmacy; Amber Kustos, president’s office; Robert Moore and Noah Slaughter, logistics; Claude Rhea, university advancement; Patty Roark, financial aid; Stephanie Sides, marketing and communication; Delane Tew, history; and Tim Wolfe, academic affairs. Rogan is Samford’s director of Human Resources.